After a strong start to the season, Tre Demps can no longer be considered Northwestern’s top offensive threat. The junior guard has drifted behind freshman point guard Bryant McIntosh in scoring and every shooting percentage, but the Wildcats (10-11, 1-7 Big Ten) will still need Demps’ punch when they take on the Cornhuskers (12-9, 4-5) on Tuesday at Pinnacle Bank Arena in Lincoln, Nebraska. Demps tied for the game-high of 18 points in NU’s last game, a losing effort against Purdue, but was an inefficient 6-for-18 shooting from the floor. The Cats will need a more effective performance against Nebraska, who possess the second-stingiest defense in the conference, yielding only 60.7 points per game. The bread-and-butter of NU’s offense against the Boilermakers was a high ball screen that isolated a driving guard against an out-of-position rim protector. 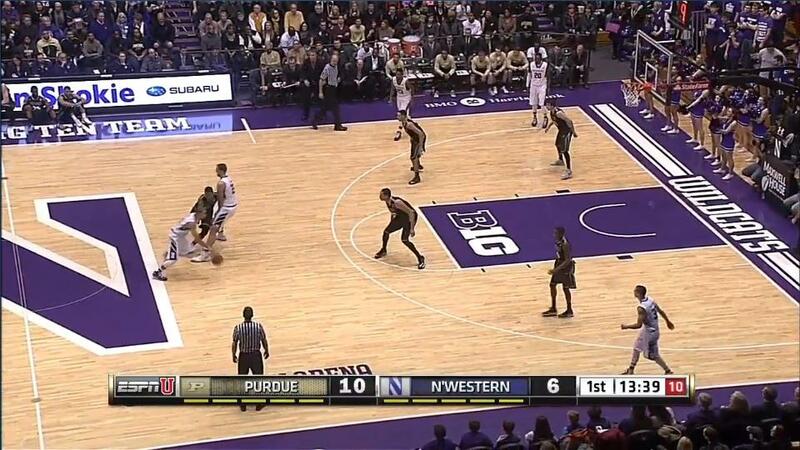 It was from this play that Demps took most of his shots, matched up with Purdue centers A.J. Hammons and Isaac Haas in the lane. A dissection of one such play reveals why Demps had such an inefficient evening. Early in the first half, Demps has the ball near half court and junior center Alex Olah runs out from under the basket to set a screen for him. Hammons, pictured in the first image at the top of the key and guarding Olah in the Boilermaker’s man-to-man defense, has to follow Olah out and leave the basket exposed. This is exactly how the play is meant to work, giving a quick guard like Demps space to get around the normally redoubtable Hammons. But things go awry in the second image. Hammons gets back on defense and positions himself between Demps and the basket. Demps is forced to pull up for a difficult mid-range jumper, a low-percentage look, and misses. The preponderance of such shots was the root of Demps’ poor shooting numbers. It’s not a knock on his ability — Hammons is a good defender and the mid-range jumper is an inefficient shot for every player. NU struggled to generate offense out of its other offensive sets and kept turning to the high-ball screen, and Demps bore the brunt of the resulting poor looks. The Cats will need more organized offense against the Cornhuskers, and getting Demps better offensive opportunities and more open shots will be vital to that effort. Even with his 39 percent shooting percentage from the floor this year, Demps is still a key member of NU backcourt. The saving grace for the Cats may be Nebraska’s offense. For as good as they are defensively, the Cornhuskers are dead-last in the Big Ten in scoring with just 57.1 points per game. If the contest plays out as a low-scoring defensive battle, NU will need to squeeze every basket it can out of Demps.